The Peoples Party Coalition is a parallel democracy initiative in the United States. Its creation derived from a think tank of activists from the Occupy movement and Anonymous collective to provide an alternative to the dual party political system that will be a true representation of the democratic society expressed in the United States Constitution and Declaration of Independence. Through political reconciliation the PPC seeks to place the power of government back into the hands of We The People. The PPC promotes no specific political party, religious beliefs, personal beliefs, ideology, or philosophy. Its focus is rather to embrace the “my enemies enemy is my friend” motto to unify advocates of liberty, truth, and freedom to peacefully bring about a completely liberated American republic. 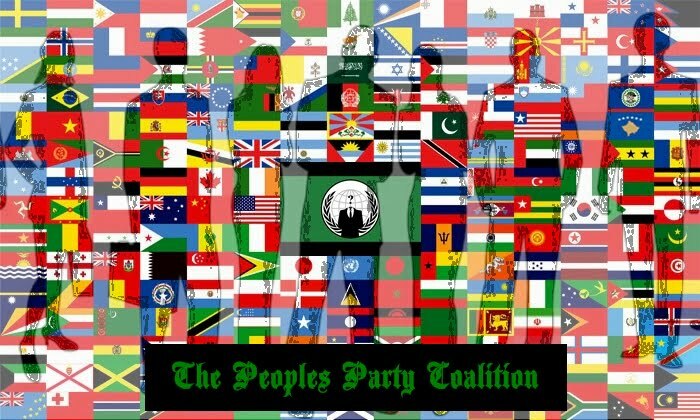 Unlike the Tea Party movement the Peoples Party Coalition will go beyond just using the current political system to change political climate by erecting its own government body. Participants involved in the Free State Project of New Hampshire and Jefferson State have committed to making the Peoples Party Coalition an example for residents of other states upset with the current political system to replicate and create for themselves in order to escape bureaucratic control, infringements of civil liberties, and violations of public trust. The PPC aims to be the catalyst for a new American Revolution that will reinstate habeas corpus, common law courts, and the United States constitution as the law of the land.